So we have a bicycle, and it has two wheels, a seat and pedals, and it gets you from A to B. Bicycles, they’ve been around a long time and perhaps it seems little is new in the world of cycling. But in the Ebike sector, innovation is bursting out everywhere – perhaps this is understandable, it’s a relatively new field and a growing market for manufacturers to sell to? (In Holland now the latest data shows that 1 in 5, or 20%, of a ll new bicycles sold are electrically assisted – and the Dutch do know a thing or two about cycling after all. See here for full story: http://www.bike-eu.com/Sales-Trends/Market-trends/2012/9/E-Bike-Marketshare-Grows-to-20-in-Holland-1068901W). Of course the innovations that we are seeing maybe in part due to the legislative restrictions that Ebikes have to conform to? After all legislation can create a market – thus in the majority of the EU (inc the UK) a standard electrically assisted bicycle must be limited to 250watts (nominal power) and the motor is only permitted to power the bicycle up to 15mph (25kph). This presents challenges – how to make the motor perform well on the hills (give it lots of torque), how to get the motor to run without too quickly draining the battery, and so on. Various manufacturers meet these challenges in different ways – and although a motor may be limited to 250watts nominal power, many at peak power are producing nearer a 1,000watts (and all quite legally). Another factor in some parts of Europe is that there are now different permitted classes of Electric Bicycle – for instance in Germany beyond the standard 250w/25kph class, there are others including a 45kph/28mph class which are still permitted on bicycle paths (within local speed limits), but the rider is required to wear a helmet and to have motorcycle insurance. So far in the UK we only have the one type of electric bicycle standard (250w/15mph) but many are lobbying to include more flexibility, such as they have in Germany. The faster bikes making things such as longer distance Ebike commuting a more practicable possibility maybe? Of course innovation is not only driven by legislation, sometimes new solutions to existing problems are sought, or simply new ways of doing things that might work better, or need less maintenance, or maybe just look better? 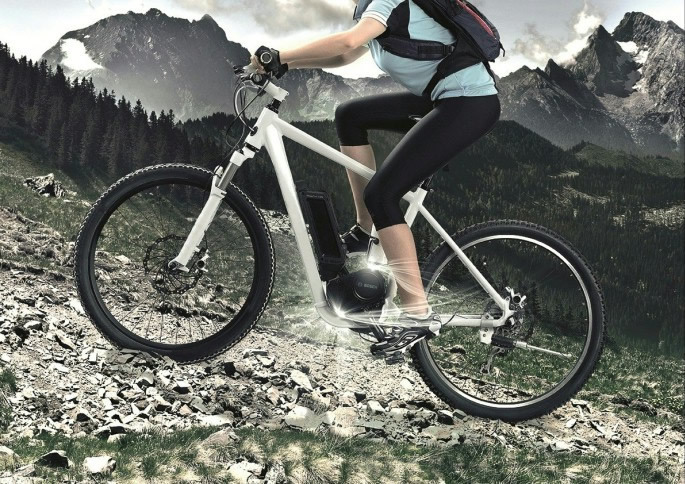 From Germany a couple of new innovative bike systems are coming along – new ways of propelling the bike along. Firstly, and already in production and shortly to be available from Wisper Bikes in the UK, are Grace Ebike’s with Belt Drives. A Belt Drive being oil free is one way of reducing the chances of getting mucky on your bike, and they do tend to require less maintenance than a chain as well – and on these bikes they also look pretty cool. Secondly, and shortly to be in production, how about shaft drive? Something you see on some (top end) motorcycles, and of course the standard system on cars, but on bicycles not a common thing – there have been one or two shaft drive bicycles, but the new system from a company called Protanium is the first in which the shaft is driven by an electric motor (as well as by the pedals). A shaft drive electric bicycle, will mean little maintenance, no dirty chain, potentially “cleaner lines”. Bikes using such innovative technology perhaps won’t be the cheapest, but they will be made to a high standard and last well (with a good guarantee). Perhaps the saddest thing is the paucity of British manufacturers in this sector – maybe, and returning to the legislative aspect, if we had other and faster classes of electric Bicycles then they would become more of interest and more widely purchased and encourage British manufacturing companies to get involved? Heck Bosch now make on of the best Ebike Motors – a crank drive (as pictured above) – http://www.bosch-ebike.de/en/ebike/homepage.html (as used in the belt drive bike mentioned above, as well as in many others), so perhaps Dyson or someone similar might one day get involved? (Interestingly some German manufacturers who initially shipped the production side of making electric bike systems, to the far east, are now bringing production back home – it seems the Made in Germany badge increases sales, as does the Made in Britain – if you can ever find it!). Switching a light on does use a large amount of energy, but only for a very short period of time (think the time it takes for Usain Bolt to run 1m). In fact, leaving a light off for 5 seconds saves the energy taken to switch a light on. So have a light off for more than 5 seconds, and you will be saving electricity. The same goes for appliances that would normally be left on standby – you can save a lot of electricity by switching them off. If a dishwasher is only used once a week (for everything) then it is probably not doing too much harm. However, if it starts to be used 2-3 times a week, plus separate hand washing for saucepans and the soaking of dishwasher items, then it starts to add up. You are looking at 3 times as much electricity and hot water, plus the extra money in purchasing tablets, for dishwashing over hand washing (throughout one week) – plus the job of emptying the dishwasher still remains. You would think this is the case, but with the efficiency of modern light bulbs and the production methods used, it is much better to replace an old light bulb as soon as possible. Plus, there are now ample facilities for recycling old light bulbs. If anyone else knows of any more popular misconceptions within the home, then please let us know! "Couldn’t agree more Nathan! Another thing we can all easily do to reduce CO2, create a more sustainable planet and to waste less energy – is to simply eat less meat and go free-range! Check out http://www.meatfreemondays.com/helptheplanet and http://www.raw.info "
The RAW campaign – kickstarting a food & farming revolution! 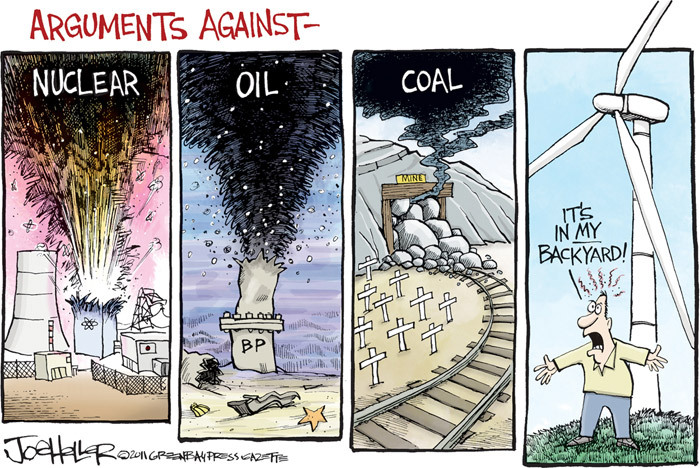 In case you hadn’t noticed, at Dorset Energized we are kickstarting a renewable energy revolution!!! 2) reduce our energy demand by becoming more energy efficient and sustainable. Our website is packed full of ideas for steps you can take today to feel good, save the planet AND even save money too! 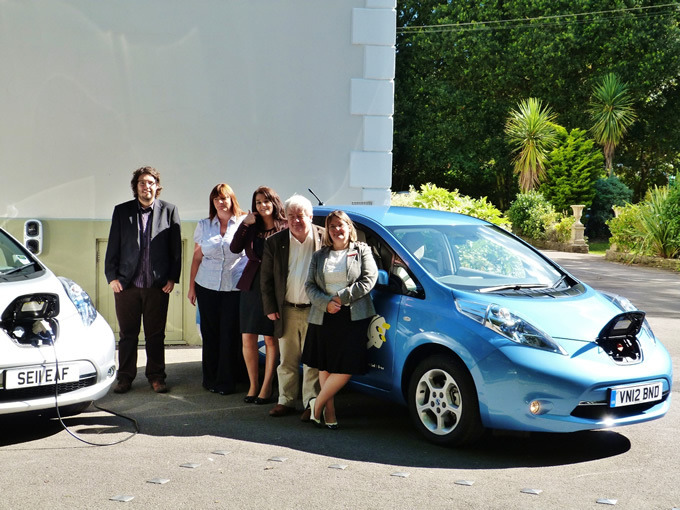 From simply switching energy suppliers to Good Energy (something I am very happy to have recently done myself! 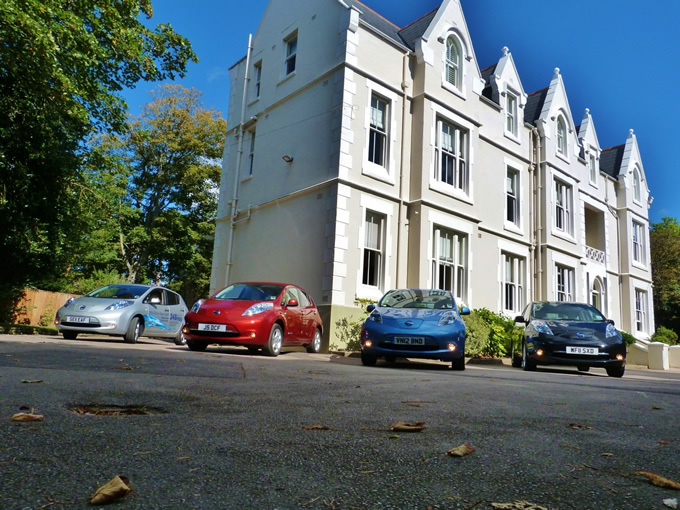 ), to buying a wood fuelled heater, investing in solar panels or buying an electric car but there are also some tips on energy efficiency, and on living in a more sustainable and natural way – something more and more of us are quite frankly yearning for! In my spare time I also run Compassionate Dorset – the local supporter group for the leading farm animal welfare charity Compassion in World Farming who campaign peacefully to end factory farming – and as it also happens to be Soil Association’s Organic September, I wanted to let you know about a new campaign to end factory farming called ‘RAW’ and how it directly relates to the most pressing issues of sustainability including climate change and food energy. Factory farms are everywhere – they raise around 2 in every 3 farm animals, and they are here in the UK and Dorset! But they’re not working. Industrialised meat and dairy farming is dangerous, unfair and dirty, placing untold pressure on animals, people and the planet. RAW will expose and explore the true cost of factory farming and build a movement for positive, practical food and farming solutions. RAW believes in better farming; farming that is safer, fairer and greener; farming that gives us all access to healthy, affordable food. Factory farming intensifies climate change, releasing vast volumes of greenhouse gases. Livestock farming accounts for around 18% of our global greenhouse gas emissions – more than the global transport sector. Factory-farmed beef requires twice as much fossil fuel energy input as pasture-reared beef. Methane and nitrous oxide are 25 times and 298 times more potent than carbon dioxide respectively in terms of their potential to intensify global warming. Added heat stress, shifting monsoons, and drier soils may reduce yields by as much as a third in the tropics and subtropics, where crops are already near their maximum heat tolerance. On average, it takes around 6kg of plant protein to produce just 1kg of animal protein. It takes over 15,000 liters of water to produce an average kilo of beef. This compares with around 1,200 liters for a kg of maize and 1800 for a kilo of wheat. In the US, chemical-intensive farming uses the equivalent of 1 barrel of oil in energy to produce 1 ton of maize – a major component of animal feed. Factory farming endangers the natural world, threatening the survival of many animals and plants. Current trends suggest that agricultural expansion in the Amazon for grazing and crops will see 40% of this fragile, pristine rainforest destroyed by 2050. One in 10 species could face extinction by the year 2100 if current predicted climate change impacts continue. Factory farming pollutes environments, contaminating the natural world with a range of potentially lethal toxins. US livestock farming is responsible for around a third of the nitrogen and phosphorus that enters the country’s freshwaters. Some large farms can produce more raw waste than the human population of a large US city. Livestock farming accounts for over 60% of our global ammonia emissions. Pig slurry is 75 times more polluting than raw domestic sewage. But this is still just a small part of it, there are also issues with; animal cruelty, food inequality, health threats, disease risk and damaged livelihoods. By taking action against factory farming, we will not just be creating a food and farming revolution; we are also tackling one of the world’s greatest sustainability challenges. Find out more about RAW and help expose the true cost of factory farming. Let’s kickstart a food and farming (AND renewable energy) revolution together! All month Soil Association have been celebrating Organic September! Organic farming reduces environmental pollution and the release of greenhouse gases from food production by severely restricting the use of artificial chemical fertilisers and pesticides. Instead, organic farmers rely on developing a healthy, fertile soil and growing a mixture of crops. Organic farming offers the best, currently available, practical model for addressing climate-friendly food production. This is because it is less dependent on oil-based fertilisers and pesticides and confers resilience in the face of climatic extremes. In fact soils on organic farms store higher levels of carbon in the soil – so if organic farming was common practice in the UK, we could offset at least 23% of agriculture’s current greenhouse emissions. Choosing organic, local and seasonal food is an easy way to significantly reduce your carbon footprint. Organic standards also insist that animals are given plenty of space and fresh air to thrive and grow – guaranteeing a truly free-range life. Professor Chris Rhodes is speaking at the Thomas Hardy School in Dorchester from 7.00 until 8.15pm on Monday 24th September 2012 on ‘What happens when the oil runs out’. Professor Chris Rhodes is an independent consultant dealing with energy and environment issues and is currently involved in projects concerning land remediation; heavy metal and radioactive waste management; alternative fuels and energy sources based on biomass and algae; and hydrothermal conversion of biomass and algae to biochar, fuels and feedstocks. His publications run to 180 articles and 5 books and he writes a monthly column for Scitizen.com on “Future Energies”. All Community Lectures at Thomas Hardy School are FREE, but by ticket only, available from the school Reception but donations are welcomed at the end of each lecture (the money raised goes to charitable causes). 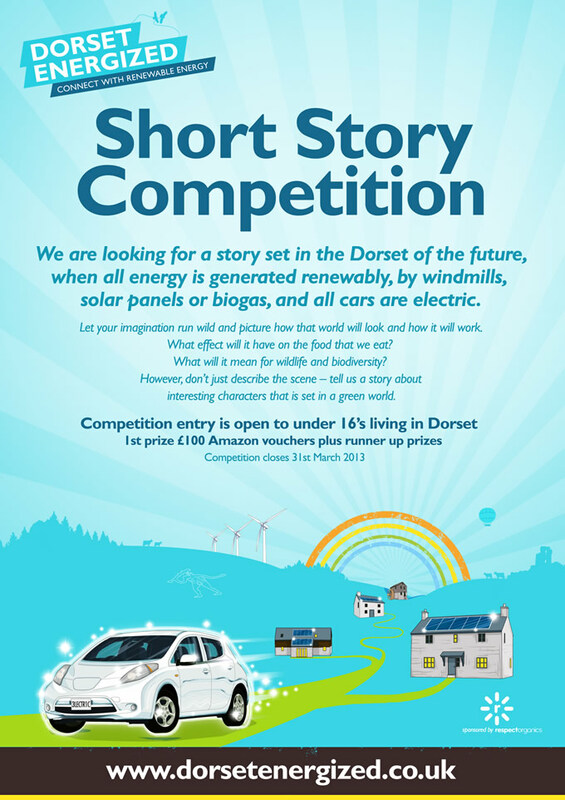 We are looking for a story set in the Dorset of the future, when all energy is generated renewably, by windmills, solar panels or biogas, and all cars are electric. Let your imagination run wild and picture how that world will look, and how it will work. What effect will it have on the food that we eat? What will it mean for wildlife and biodiversity? However, don’t just describe the scene – tell us a story about interesting characters that is set in a green world. The competition is open to all writers aged up to 16 on the closing date of the competition, which is 31 March 2013. You must be living in Dorset and attending school in Dorset. The story can be up to 1000 words. It must be typed, double-spaced, on only one side of the paper. The pages must be numbered, and you must not put your name or address on the pages. Each story must be accompanied by an entry form. There is no entry fee. The list of winners and the winning entry will be posted at www.letsgetenergized.co.uk by 31 May 2013. First prize is £100 Amazon vouchers. There will be a second prize of £50 Amazon vouchers. Plus two runner-up prizes of £25 Amazon vouchers. The judges’ decision is final and no correspondence will be entered into, or comments given on individual entries. The judging panel will be led by Wendy Pillar, MA, who has twenty-five years’ experience in the publishing industry. 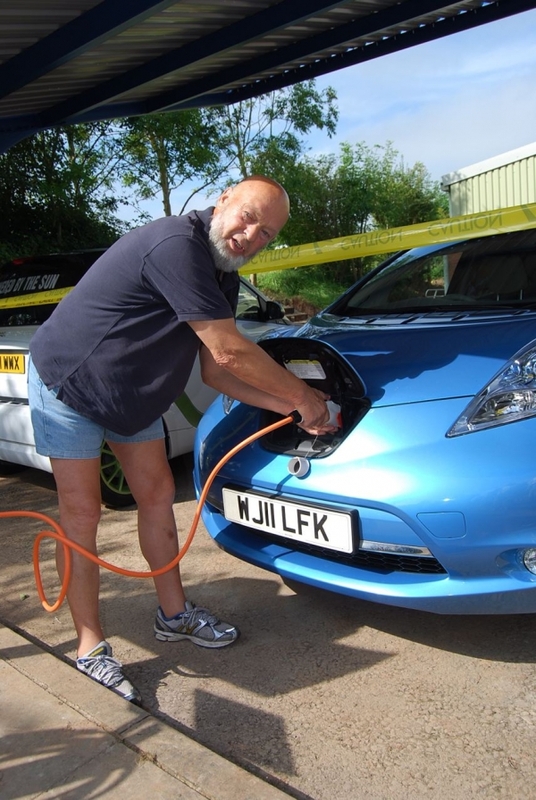 Copyright remains with the author, but Dorset Energized and their partners including Energize Stur Valley retains the right to publicise winning and runner-up entries. 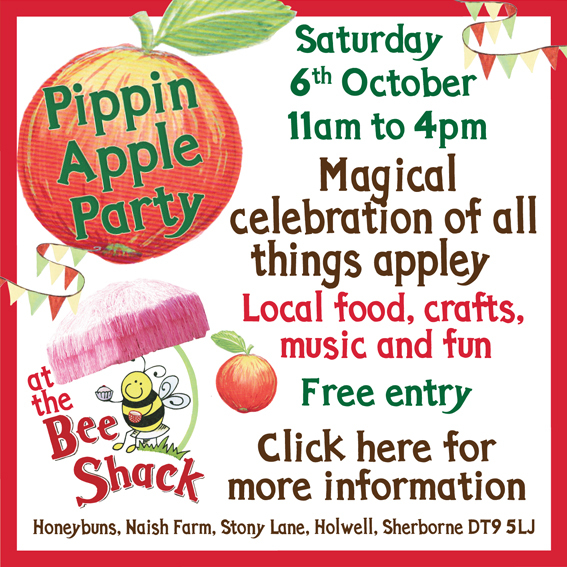 Dorset Energized have been invited to have a stand at this magical celebration of all things appley on Apple Day at Honeybuns, Naish Farm. Plus of course you can find out how to connect with renewable energy at our Dorset Energized stand. This afternoon, Dorset County Councillors approved the proposal for a single 500kW wind turbine at Masters Quarry, East Stoke (near Wool and Wareham). The Councillors voted in favour, with only 1 abstention. The fact that a wind turbine of this scale obtained planning consent at Council level is very encouraging and Dorset Energized believes it is an important step forward! Approval for both the Alaska Wind Farm and Masters Quarry Wind Turbine is a fantastic result as there is a situation now where there are options. Alaska Wind Farm, being the project with the larger output, is the preferred option but consent for Masters Quarry means there is a fall back plan just in case. 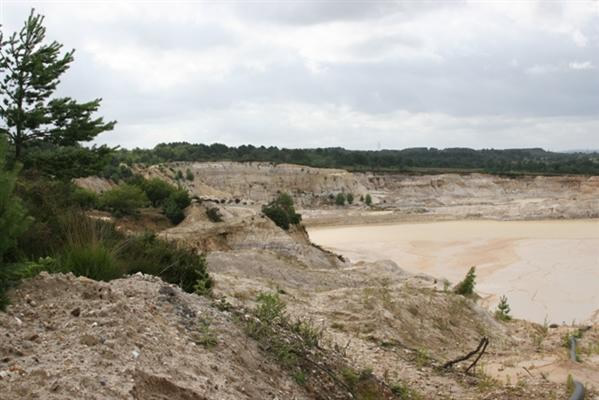 In any case we are hopeful that wind energy will be generated at Masters Quarry within the next couple of years. One complaint about solar power sometimes raised, is how unattractive solar energy installations appear. They so often, some say, do little to enhance the appearance of buildings or indeed the landscape. Well from Germany comes a new design by architect André Broessel for a beautifully-striking spherical glass solar energy generator that could revolutionise the appearance of electric vehicle recharging posts! It’s for producing either solar electric power, or hot water from solar heat and looks very different from what we are used to. It utilises the focusing power of a sphere – in the same manner a drop of water can focus the sun’s light – to produce useful energy. It is claimed by the inventor to be up to 35% more efficient than existing designs and could conceivably (it is claimed) produce electricity from the light of the moon as well as the sun. An extraordinary possibility and one offering the chance of making solar power more viable and cost effective – and to my eyes at least larger versions might well enhance the landscape or a cityscape, while a smaller installation could bring something interesting to a garden or roof. The new design is in its early stages as yet, so currently no pricing is available to compare with standard types of solar power installations, but it just goes to show that there is much more to come in the developing world of alternative energy technology.